Why live anywhere else in Manhattan? The Ritz Plaza presides over the pulse of New York in the heart of Manhattan – Times Square. Live just steps away from world famous theaters, hotels, restaurants and cultural attractions. At the end of your adventure, retreat back to a beautifully appointed, magnificent home that is The Ritz Plaza. Escape the hectic streets of New York as you walk through our doors and are invited into our relaxing lobby, welcomed by our 24-hour staff. The Ritz Plaza is a newly renovated, luxury residential building with balconied units that offers spectacular views of the city. Take advantage of RP Fitness, our new, state-of-the-art fitness center, or be one of the few New Yorkers who can take a swim in their own indoor pool. The Ritz Plaza is a welcoming environment with year-round gatherings in our newly revitalized social center, RP Social. Walk out your door and experience the magic of the greatest Theater District on earth. Sample one of the myriad restaurants…the best that New York …and the world has to offer. Put yourself at the center of one of the business hubs of New York with landmark office buildings, corporate headquarters and commercial complexes of many of the top corporations in the country just steps away. Centrally located, The Ritz Plaza gives you immediate access to all that New York has to offer with subway and bus stops in every direction (N, Q, R, W, 1, 2, 3, 9, A, C, E). If you want to escape the city, Central Park is a short walk away and the new Westside Bike path and Hudson River Park are easily accessed at the waterfront on 48th Street. Ritz Plaza residents enjoy a full array of luxury services and amenities that make it one of the premier rental buildings in all of Manhattan. You’ll be delighted as you retire home from the streets of New York and are greeted by our friendly 24-hour lobby staff in our elegant lobby with soaring double-height ceilings and terrazzo floors. Work off the day’s stress with a workout in RP Fitness, our state-of-the art fitness center, take one of our many fitness classes including Yoga and Pilates. Enjoy Aqua Aerobics or swim a few laps in our 40-foot, heated pool. After you’re done tuning your body and mind, relax at one of our several indoor or outdoor lounges. • State of the art communication system that lets you view your deliveries on a monitor or alert the super with repair requests by email. • Sophisticated multi-camera security system that monitors all public areas. • On-premise dry cleaning and drop-off laundry. • Hi-tech, secure laundry facility with electronic cards servicing 24 washers and dryers. • 24-hour attended garage with special tenant discounts. • Five high-speed elevators, including one elevator dedicated for freight service. • ATM available in the lobby. • On-site building owner, leasing office and property management professionals. Pamper yourself with all the comforts and conveniences that any home should have. 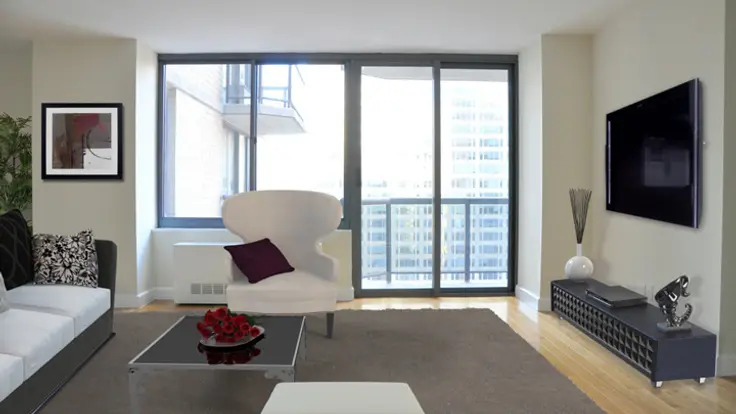 At The Ritz Plaza, many of our apartments have recently been beautifully renovated and include extra-wide balconies and floor-to-ceiling windows with spectacular city views. Euro-style kitchens featuring crisp, light or dark wood cabinets with all top-of-the-line, stainless steel appliances flow easily into the dining/living rooms, which have been magnificently finished with hardwood, parquet floors. All apartments feature large walk-in closets and for your safety and peace of mind, sprinklers are installed inside each unit and throughout The Ritz Plaza.